In order to avoid signal noise and keep things organized I ran signal, power, and speaker wires down the middle, right, and left part of the cabin respectively. In order to run wire down the center of the cabin, the majority of the cabin must be removed. 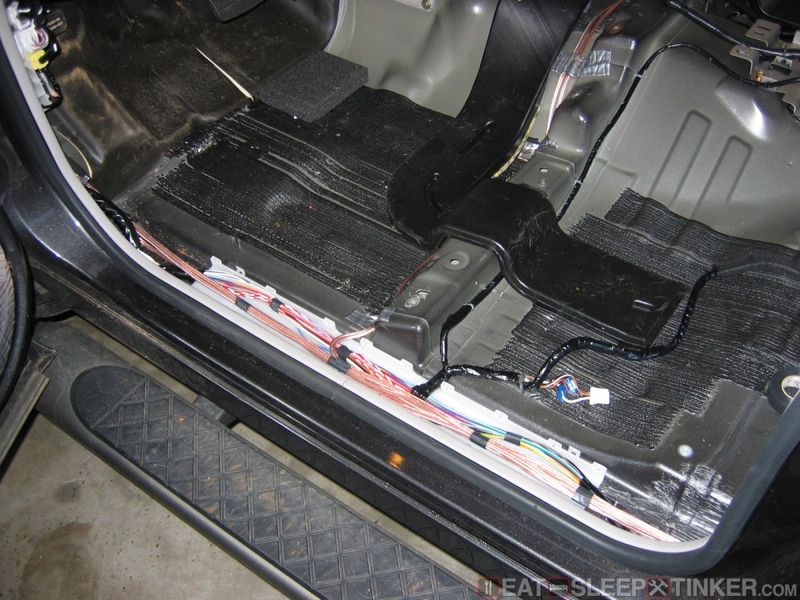 I chose to run all my speaker wire from the amp rack up the left side of the cabin then to the individual speakers. I mounted my crossovers (4) on the amp rack for easy access, so in total there would be 8 seperate sets of speaker wire running from the rack. I chose 14ga wire, as it was smaller than 12 and would make it easier to fit two sets of it through the rear door rubber boots. I shopped online for speaker wire, but the prices were not that great, especially since I would need a good deal. It’s difficult to estimate just how much I would need, so I simply purchased a 200′ spool from Lowes. While this type of wire isn’t as flexible as car-audio specific wires, it was still flexible enough for the installation. I cut all my wires extra long as a precaution, and ended up using over 100′. Since I was also matting the entire cabin I had already removed all the seats, console, carpet, and plastic interior trim. This made it fairly easy to run the wire. Where possible I ran the wire in the existing OEM wire “tunnels” that are installed below the door opening finishers. This helped keep the wiring together and protected. I used copious amounts of electrical tape and zip ties to keep everything organized and secure. 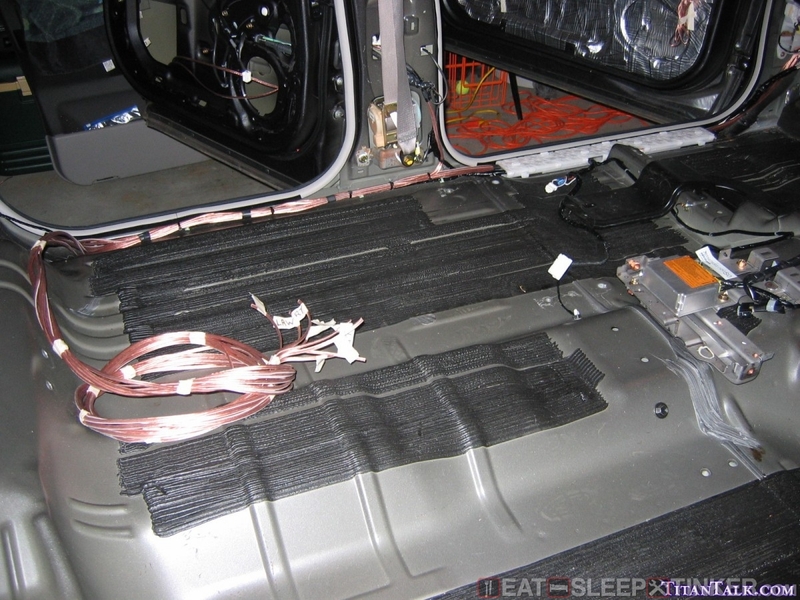 In areas where zip tying the wires wasn’t possible, I used aluminum HVAC tape to secure the wire to the body. After running the wires up the left side of the cabin I split the right front off and ran it across and under the dash. The front door rubber boots are more difficult to access than the rear and took several attempts before I had success at running the wire to the door. To do this I simply pulled the boot loose from the pillar and door and compressed it like an accordion. 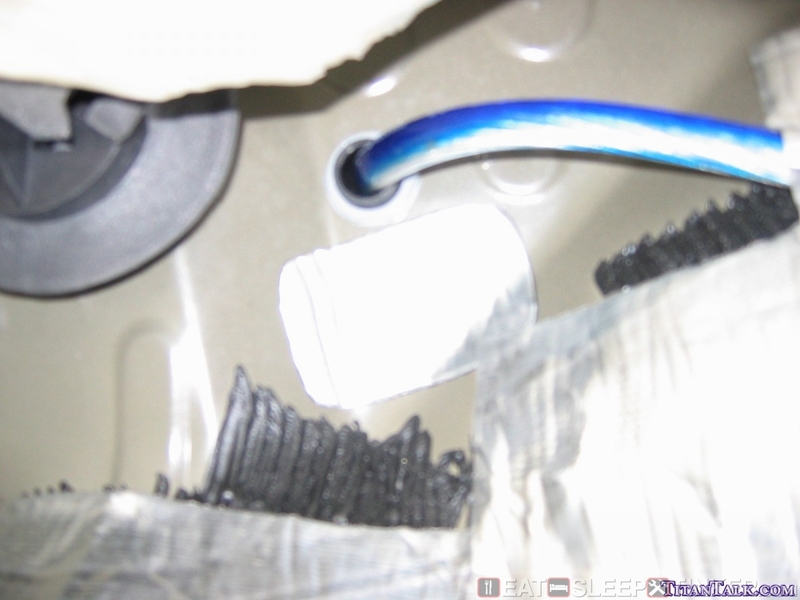 The stiffer speaker wire made it fairly easy to slide through the boot. The tweets were mounted in the stock location and were easy to wire. That section of the dash is hollow and allowed me to pull the wire up and through. Both tweeters and mids were installed into the doors so I had to run the wiring up though the B-pillars then through the rubber boot into the door. This boot is larger than the front one and easier to access, which was good considering I had to get two sets of 14ga through. 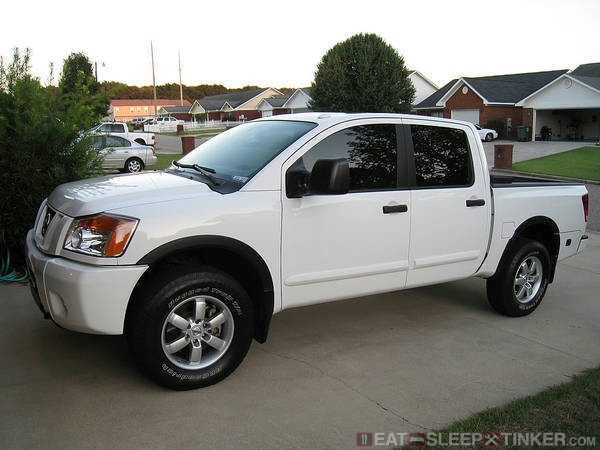 The right rear door wire was run up the left side of the cabin then across the center of the cab where the front seats mount, then to the right side B-pillar. 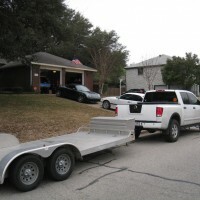 Photo Description: This was taken looking in from the passenger’s side rear door. Again you can see the wire running through the tunnel, now the cover is reinstalled. There is no tunnel at the rear doors, but there are factory wires running down the channel. I used tape to keep the wires together then zip tied the bundle to the oem wiring. You can see all the extra wiring coiled up waiting for the amps to be installed. Note: I’m very impressed with these cables, although I must warn you to only unplug them by pulling on the actual metal plug and not the cable itself. I accidently detached one of the small inner wires from the plug end. It was easily fixed by resoldering it. I added some glue to the inside of these plugs to help prevent this. The RCA cables were installed after the matting and amps were installed, because I would be running them down the center of the cab on top of the matting. I ran them down the angled right side of the transmission tunnel to avoid crushing the wires underneath passengers’ feet. The wire was secured using HVAC aluminum tape. As I mentioned earlier, there was more cable then needed. This extra wire was coiled and secured with electrical tape and zip ties underneath the center console mounting bracket. At the front of the cabin the cables were snaked up to the passenger foot well where the Matrix would be installed. The short 1 meter interconnects were run from the HU down to this point as well. The connections at the amps will be covered later in the amp rack portion. Because I am running a large amount of power in this system, the choice of 0ga power/ground wire was a no brainer. Again I went to KnuKonceptz for the power wire. 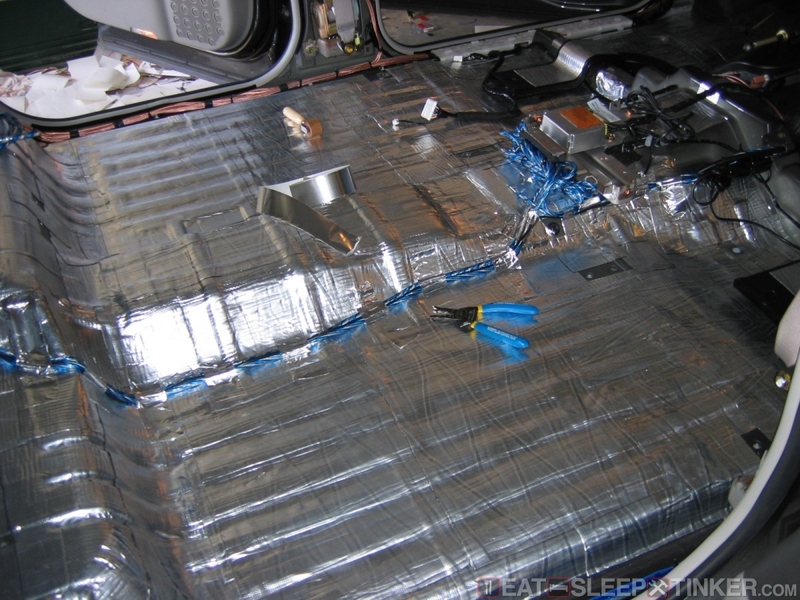 The power wire would be run from the battery, through the fire-wall, down the right side and to the right rear corner of the cabin where a fuse distribution block would be mounted to the amp rack. The power wire was connected to the battery using a KnuKonceptz positive terminal. A short length of wire was then ran to an inline ANL fuse holder that is mounted to the top of the A/C box using industrial velcro (for easier removal during fuse installation.) The wire then continues down the right side of the engine compartment to just above the A/C rubber drain line. I covered the wire in split loom, then covered that with electrical tape to prevent chafing and heat related damage. A 1″ diameter hole was drilled through the firewall from the passenger’s footwell. Then a water tight grommet was installed around the wire. These type grommets have an inner rubber seal that is compressed on the wire when you tighten it down. Once inside the cabin the power wire was run just like the speaker wires on the opposite side. I ran it through the oem wire tunnel and down to the back corner. 0ga is pretty thick, but it wasn’t any trouble fitting it down the side. The 0ga ground wire was run from a ground distribution block mounted on the rear of the amp rack to a bolt protruding from the lower rear wall. 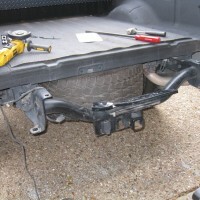 This bolt attaches an L-shaped bracket to the rear wall and rear cabin floor. The bracket is bare metal so no paint removal was required. The oem nut on the bolt was used to secure the 0ga ring terminal. I hadn’t originally planned to upgrade the battery, but after running the oem dead twice after very little power usage, I decided I might need an Optima. The local auto parts stores didn’t carry the reverse terminal Optimas like the Titan is setup to use, but a standard terminal layout will work with no modification. The factory grounding cable would also need upgrading due to the increase in power drawn from the battery. The oem cable couldn’t be larger than 8ga by my estimate, and many members have reported problems with running it and large systems. 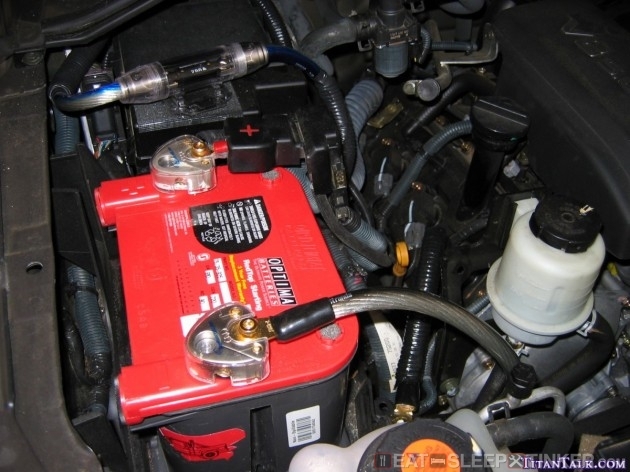 Installing the Optima is no different than installing the factory battery, except that it goes in backwards. I mentioned that I couldn’t get a reverse terminal battery (+ on right), so the easy fix is to just turn it around. The Optima has provisions for a base mount and the oem clamp locks it down nicely. 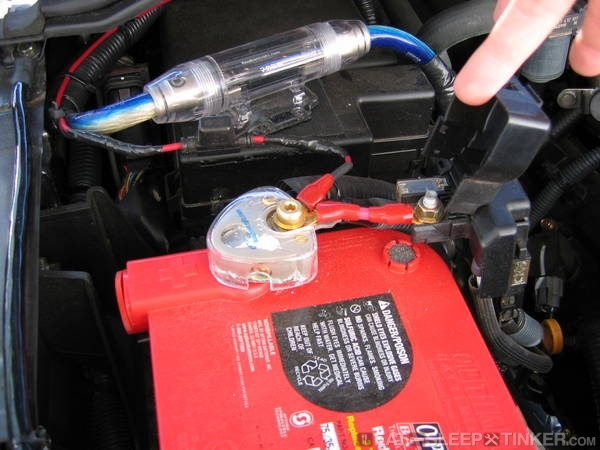 The factory fuse terminal requires a little modification for any aftermarket amplifier installation so that you can get you power wire to the battery post. The Knuknoceptz terminal allows several different connection arrangements to make things easy. I used a short length of very stiff (low stand count) 8ga fitted with ring terminals on both ends to attach the factory fuse cluster to the battery. I notched the plastic oem terminal cover to allow it close properly over the new 8ga wire. The 0ga power wire was simply secured into the battery terminal with the allen set screw. The new 0ga ground cables were very easy to install as well. I removed the factory ground cable first. It’s attached in three places: at the battery, the bottom of the battery tray, and too the engine (I believe the A/C compressor.) I used the oem ground cable as a guide when cutting my new 0ga. This results in two short pieces of wire to which you must attach ring terminals to. Then it’s secured back into place just as the factory one was. Just like the power wire, I covered the lower ground wire with split-loom and electrical tape. Tip: I found that a big set of Vise-Grips work well for crimping the large ring terminals on the 0ga. 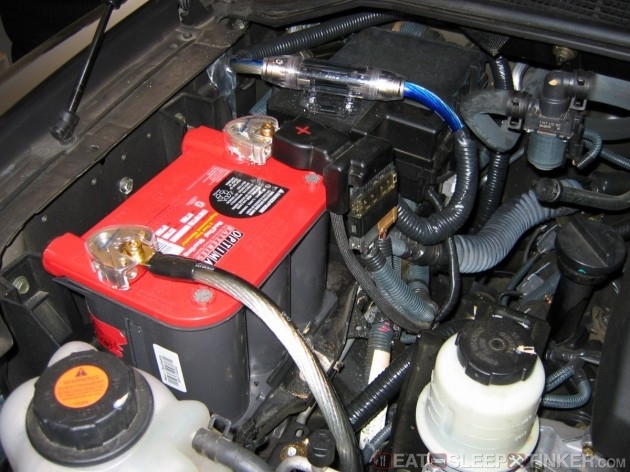 This should give you a better idea of how I attached the factory fuse connector to the aftermarket battery post clamp.